“Om Durgayay Namah. I am in the flow. I live life with trust and ease." 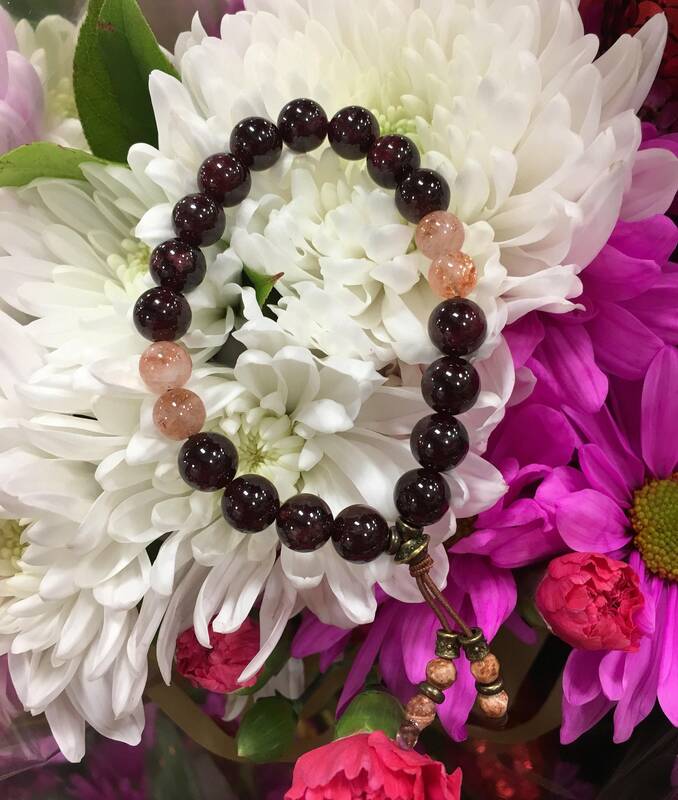 The Intimate Connection Mala Bracelet features stunning AAA grade rich deep red Garnet gemstones along with AAA peach Sunstone beads, a carved cedar wood ancient prayer bead and tiny Picture Jasper beads to inspire love, trust, devotion and optimism. Sunstone is a joyful, light-inspiring gemstone. 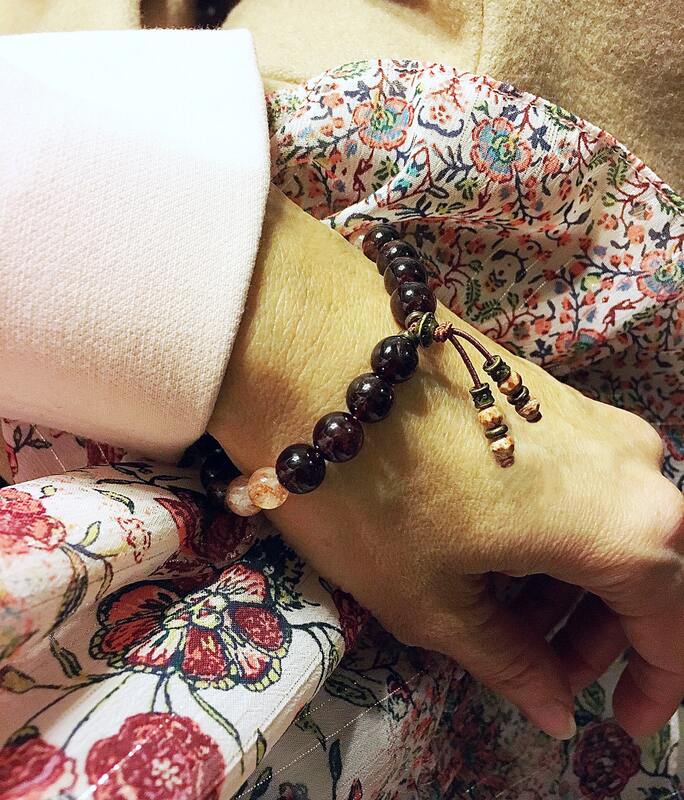 If life has lost its sweetness, Sunstone will restore it and help you love and nurture yourself. It allows the real self to shine through in happy alignment. 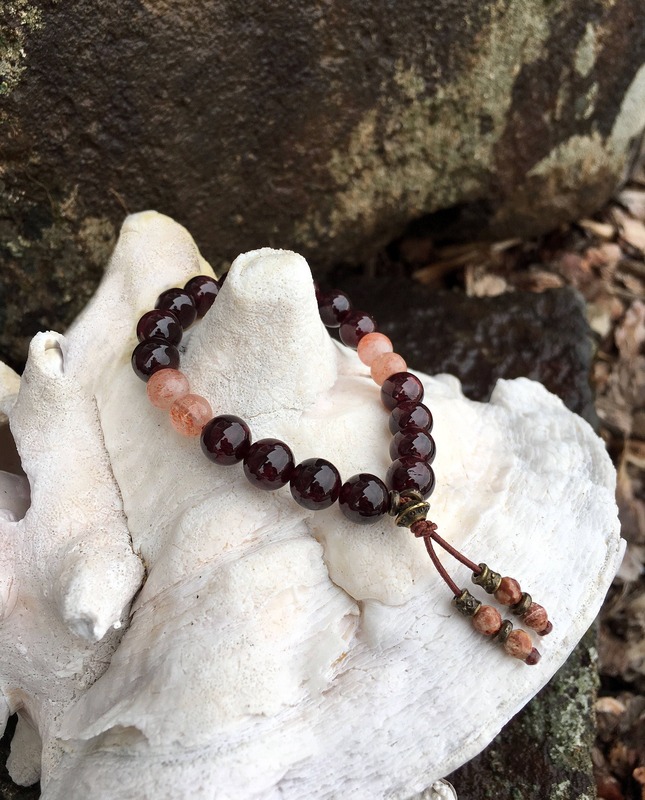 Sunstone is an alchemical stone that brings about a powerful connection to light and the regenerative power of the sun during meditation and in every day life. It is extremely useful for removing energetic “hooks” from other people, whether it is mental or emotional. It facilitates self empowerment, independence and vitality. If procrastination is holding you back, Sunstone will help you overcome it. It is a powerful antidepressant and can easily lift a dark mood. It is particularly effective for seasonal affective disorder, lightning the darkness of winter. Sunstone can also stimulate self healing powers. Picture Jasper is known as the "supreme nurturer". These gems work with all of your chakras to bring you stability, harmony and balance. Beautiful swirls of gold and brown hold vibrational messages, or 'pictures' from the past. As one of the oldest known gemstones, it is mentioned in the Bible several times. Picture Jasper provides physical protection, absorbs negative energy, transforms ideas into action, and re-energizes the body. 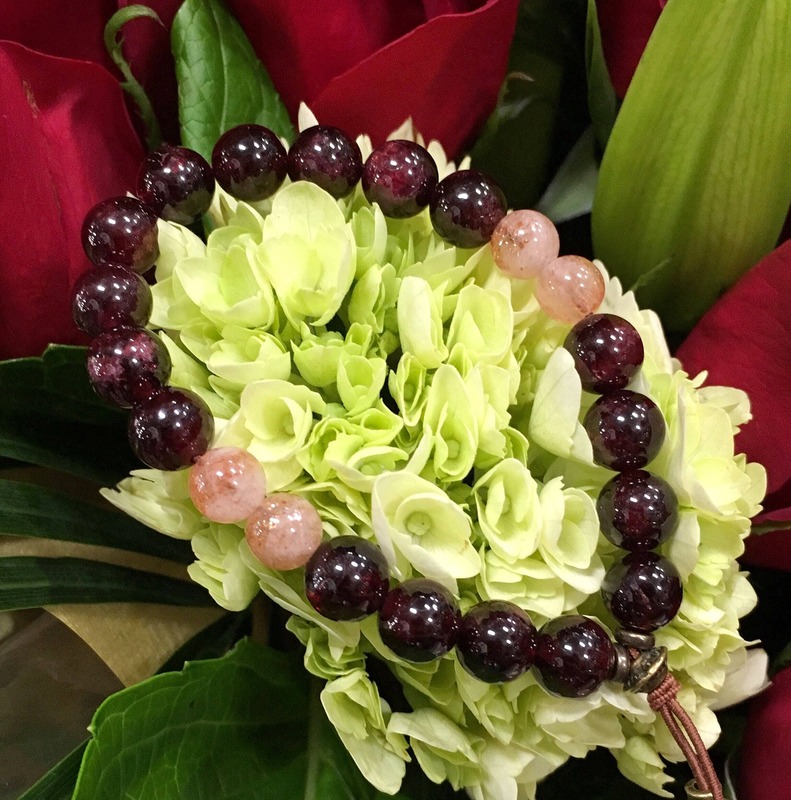 Wearing this bracelet can help sustain and support you through times of stress, bringing you tranquility and wholeness. 8mm, 6mm and 3mm high quality gemstones, strung on strong elastic stretch cord. One size fits most wrists. Custom sizing is available.